Watford Valves has cryogenically treated some of the more popular and best sounding JJ electronic formally known as Tesla valves. This process makes a permanent change and the benefits do not deteriorate over time or upon return to operating temperature, it changes the whole way the vacuum tube performs. The biggest benefits I have found have been a dramatic improvement in dynamic range. Bass response has been clearer with reduction in microphonics. The soundstage is bigger with more detail with a big reduction in the noise floor. The really most starling fact has been how the valve operates under saturated and overdriven conditions in guitar amplifiers. The distortion is smoother with less hardness and is musically pleasing to the ear. This 7 valve set of specially selected high gain Cryo treated ECC83-S JJ/Tesla covers all amplifiers models and pre amplifiers that have a 7 valve pre amp section with a balanced valve for the phase inverter position. 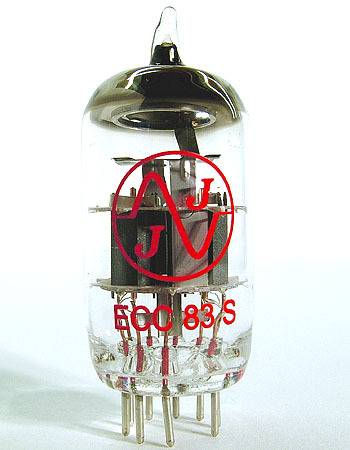 The ECC83-S JJ/Tesla has become one of the most popular ECC83/12AX7 types made today. The valve has a clear and warm overall sound and has a later break up than most modern ECC83/12AX7 types. It is low in microphonics, has a well balanced sound and distorts very evenly. We improve this benchmark via Cryo treatment and the improvements are quite staggering. The Cryo ECC83-S JJ/Tesla gives a fuller and tighter bass response. The blurring around the upper midrange under saturation is gone with the upper mids sounding crisp, detailed and even. The valve has more attack on solos and has a smoother treble response. Each Cryo ECC83-S JJ/Tesla goes through a series of tests that include microphonics, cathode heater insulation, gas, noise and Symmetry and is specially selected for linear performance with low noise. The High Gain valve sets have been selected to have typically ½ of a db gain more than the standard item. This set is for the guitarist who wants early breakup when compared to the standard gain set. The High Gain sets have been produced for Hard rock, Metal and Thrash or players with 7 string guitar where punch, gain and clarity under extreme saturation are of importance. The clarity that the Cryo Treatment provides is not attainable with standard items.